You can get a truly crazy amount of groceries into that pannier. Whoops--the chocolate bars show in this shot. Just how much can you haul on a bike ride to the grocery store? Depends on how many bags you have! 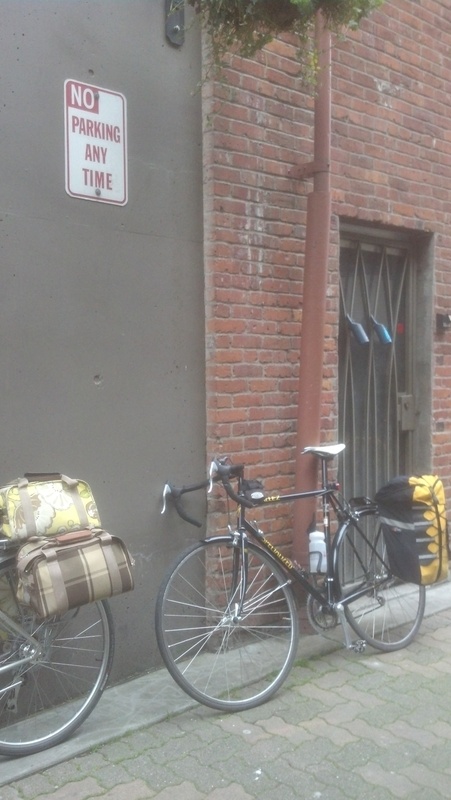 A “No Parking” sign never fails to amuse when it crops up in proximity to bikes. So irrelevant. When we lived in Spokane the grocery store nearest our house was just over 1.5 miles away uphill, which meant I got to race downhill fully loaded when I made a grocery run via bike. We’re currently living in downtown Seattle with abundant groceries within a few blocks at Pike Place Market, Kress IGA, or the City Target. None of these, however, having the ingredients for the family bran-muffin recipe that calls for both All-Bran and Bran Buds, a longer ride on a Sunday afternoon was in order. The Fred Meyer in Ballard, a source for said bran products, makes for a nice destination, particularly given its proximity to Trader Joe’s. We used the flat Elliott Bay Trail for the majority of the round trip of over 12 miles. Seattle bike blogger Rebecca Roush used this route in a post she captured on helmet cam last summer. You can check it out starting at around the 2:24 mark (first stretch is in the International District). She freaks me out a bit with the stretch where she rides to the right of the double yellow line on Alaskan Way–we weren’t doing that!–and we took a different way to reach the Ballard Bridge that involves staying on the trail a bit longer, but the video gives you a look at the peaceful Elliott Bay Trail ride that stands in stark contrast to the squinchy little path they give bicyclists and pedestrians to share on the bridge (around 7:35). That is a freaky, freaky space to ride in, let me tell you, particularly if, like me, you’d appreciate a slightly higher fence between you and the precipitous drop to either industrial crash-landing space or the water below. Pictures below illustrate what we were able to haul in bags on two bikes that weren’t fully loaded. The Po Campo Logan Tote could have held more; I just distributed items across all 3 bags on my bike for balance. Tagalongs and Thin Mints stand as evidence that those darn Girl Scouts caught me right outside Trader Joe’s. Contents of my second Po Campo Logan Tote on our grocery-toting bike ride. The Po Campo Loop Pannier is a nice shape for hauling boxes of cereal. It too could have held more but I didn’t want to squish the mangoes. You can get a truly crazy amount of groceries into the old Aakel pannier. Whoops–the chocolate bars show in this shot. 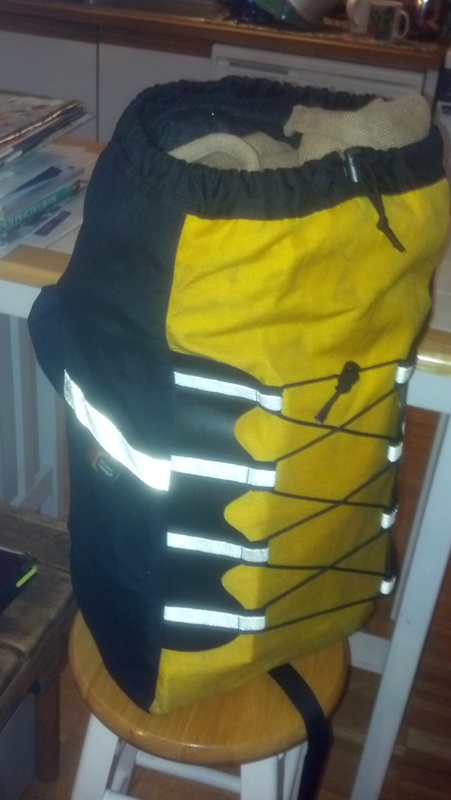 The mother of all panniers: This old Aakel I got years ago expands to hold so much the balance of the bike is affected. Two hours of quality time with my sweetheart with no electronic devices–check! Healthy exercise without paying for any classes or gym access–check! Grocery shopping for the week–check! 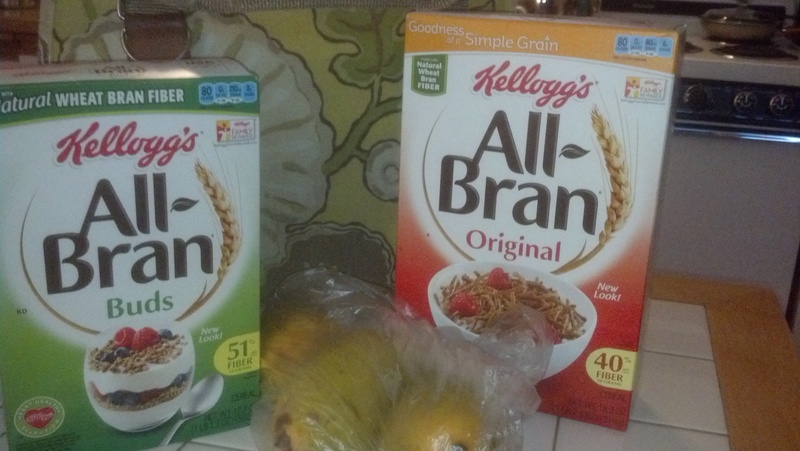 Ingredients for Mom’s Bran Muffins–check! 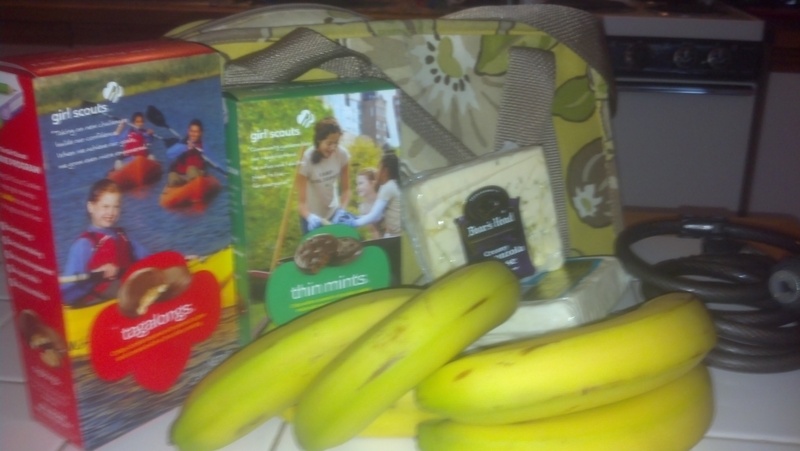 Accidental encounter with Girl Scout cookies–check! And I didn’t even have my Donkey Boxx on the bike. What do you usually haul on your bike? Next post: 30 Days of Biking 2013: Yes We Can! I have two of the folding Wald baskets on the back of my bike and each one holds the equivalent of 2 paper grocery bags. 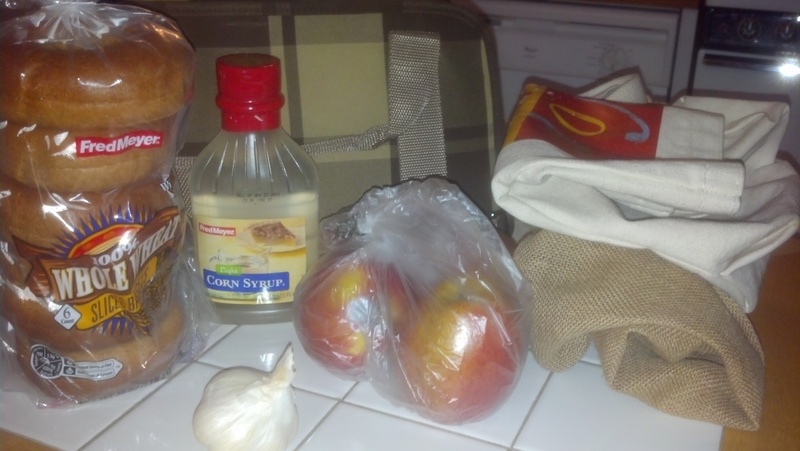 I use the reusable bags that you can buy at the store since they’re the same size, are more water resistant and I can tie the handles together to secure my groceries. I live at the bottom of the s. hill in spokane so it can be quite the ride to get up to the rosauers or super one. However shopping at Main Market, sonnenburgs and Bay’s/Best asian market is very accessible. One trip I only filled one bag, but it contained both a six pack of ginger beer and a gallon of milk, so I had to redistribute. Another trip I forgot how much space a head of nappa cabbage would take so it ended up bungied to the back of the bike. 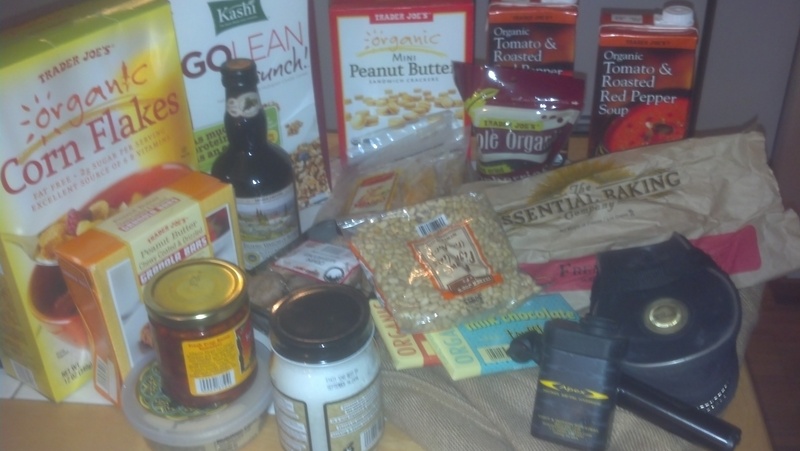 I wrote about this…includes photos of my grocery load 1 trip with 2 rear panniers. I bungied cord down the pack of 12 toilet tissue rolls.